Home Rodents Hamsters Can Hamsters Eat Apples & Their Skin & Seeds? Apples are a popular and healthy fruit, often used in cooking or eaten as a snack. This juicy fruit also offers us numerous health benefits. Therefore, it isn’t unusual to wonder if you can share a little with your hamster. However, can hamsters eat apples? The answer is YES, hamsters can eat apples. They are safe and healthy for them to enjoy too. However, there are some basic rules to follow when feeding this fruit to your hamster, to reduce any possible side effects. In this article we will uncover all the benefits and the possible risks associated with feeding apples to your pet hamster, so that you can make the best possible choices for your beloved pet. Apples are full of vitamin C, high in fiber, low in calories and contain no cholesterol, an all round great choice for a healthy addition to your hamster’s diet. Vitamin C is important for the function of the immune system, helping your hamster to fight off disease. It is also required for healthy skin, and to help regenerate and heal wounds. In one study involving hamsters, vitamin c also helped to protect against and delay cancer in the cheek pouches(1). Apples are a well known source of antioxidants. These limit the effects of damaging particles called free radicals in the body. Although not many studies have been done in hamsters, the antioxidants found in apples are thought to help reduce the risk of certain cancers, diabetes and heart disease in humans(2). Dietary fiber is very important for a healthy digestive system, keeping the normal gut bacteria in good working order(3). Now that we have discovered the possible health benefits apples can offer your hamster, let’s take a closer look at the risks of eating apples, and how to avoid them. Are There any Risks of Hamsters Eating Apples? When introducing any new food into your hamster’s diet there is always a risk of upsetting the digestive system, most commonly causing diarrhea. This can be reduced by introducing new foods very slowly and in tiny amounts. If you notice that your hamster has a reaction to a new food, then it is best not to continue feeding it as part of his or her diet. It is a well known fact that hamsters like to hoard their food, often in a corner in their cage. However, fruit quickly rots and can turn moldy after a few days, which can make your hamster sick if they later eat it. Therefore, it is best to offer small amounts of apple, and remove any uneaten pieces that same day. Are Apple Seeds and Peel Safe to Feed a Hamster? Apple peel is actually quite nutritious, containing dietary fiber and vitamins. Therefore, you don’t need to remove the peel, as hamsters can safely eat it. It never hurts to give the apple a good wash to remove any possible pesticides before feeding to your hamster. However, apple seeds should NEVER be given to hamsters. The seeds contain cyanide, which is toxic(4). Humans would need to eat a lot of apple seeds before they suffered any ill side effects, but hamsters due to their tiny size could get very sick or even die after eating only one seed. Therefore, always make sure to carefully remove the apple seeds when preparing this fruit. How Much Apple Can My Hamster Eat? A few mouthfuls of apple once or twice a week should be sufficient. This amount adds variety and flavor to your hamster’s diet, and offers health benefits too. Offering your hamster lots of apple is more likely to cause an upset digestive system. Fresh fruits such as apple, are a safe and healthy way to supplement your hamster’s diet. However, apple should be given in moderation, as too much could cause an upset digestive system and diarrhea. A few mouthfuls of apple once or twice a week as a treat is enough for your pet hamster. Finally, it is important to remember that apple seeds should always be carefully removed and never offered to your hamster, as they are toxic. 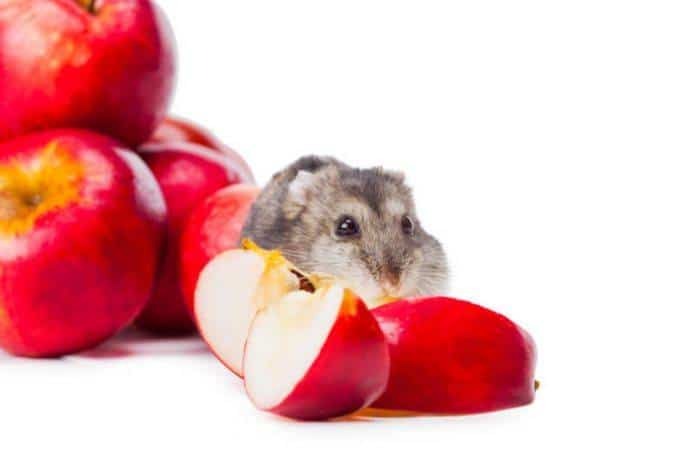 Hopefully we have answered the question “can hamsters have apples?” and you have found this article informative and now you can make an informed decision about feeding apple to your pet hamster. Feel free to share it with another hamster loving friend!